Have you heard of Edith Macefield? This old lady turned down a million dollar offer to sell her home to make way for a shopping mall in Seattle, Washington. 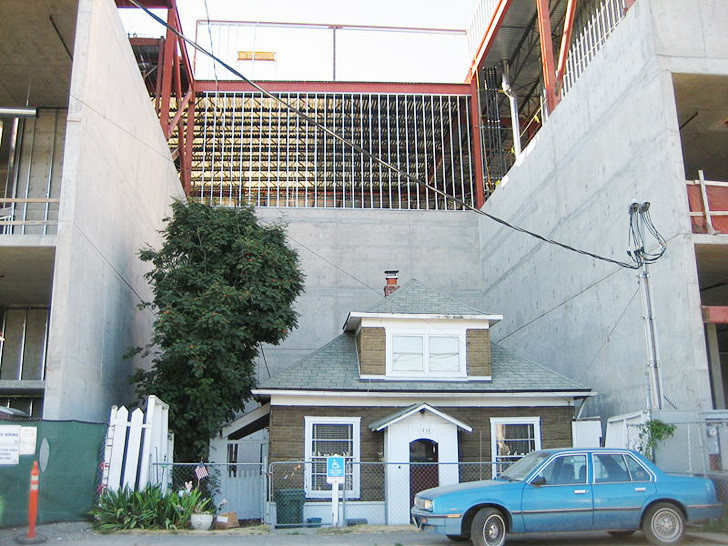 Without Edith’s land, the developer had to alter the building’s plan so that it would meander around the small, two-story house. At 84 years old, Edith become a folk hero. And if you think her house looks familiar, it’s probably because it looks amazingly similar to (and could be the inspiration for) the famous flying house in Pixar’s animated film UP. 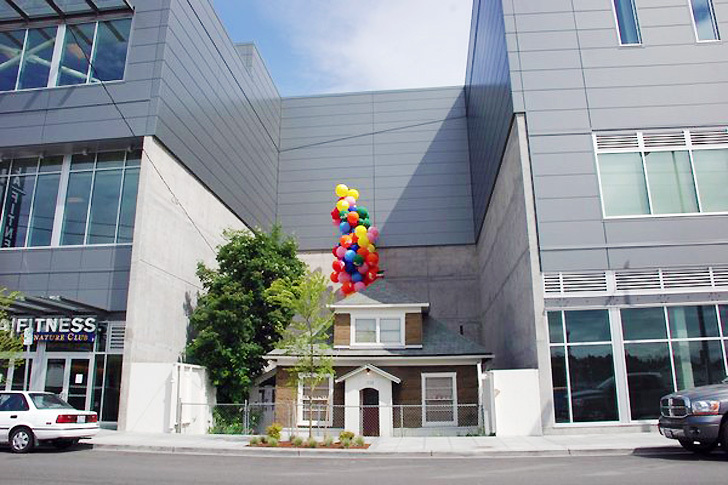 The story of Edith Macefield reached the public for the first time in 2006, when she refused to relocate and make way for a large shopping mall in the Ballard neighborhood in Seattle. Over the decades, Edith had the chance to see drastic changes taking place in her little neighborhood. Gentrification enabled the replacement of old houses with boutique shops and condos, and eventually these commercial structures closed in on her house. Developers offered her no less than a million dollars to move—an offer which she famously refused. The shopping mall was eventually built, but it had to be modified so as not to disturb Edith’s property. Related:9-Year-Old Boy Raises $3,000 To Save Detroit’s Parks by Selling Lemonade! Edith passed away in 2008 at the age of 87, but she still managed to surprise everyone one last time. She had willed her home to Barry Martin, the construction chief at the adjacent building site, with whom she formed an unlikely friendship. Barry looked after her and drove her to the hospital after she was diagnosed with pancreatic cancer. Since Edith’s death, the house has been remodeled—its walls fixed and windows replaced. Plans are in the works to eventually raze the house and create a public square below, in memory of Edith’s bravery and integrity. Related: 89-Year-Old Man Develops Bladeless Bird-Friendly Wind Turbine! @melior because money is all that matters, business is entitled to private property, it's dementia to want to keep your house? Nice. Yes Melior, I\'m sure you developers are just trying to help people out. It has nothing to do with lining your pockets huh? Give me a break. Melior.. its sad to see your comment and with inhabitat pic as your display pic. Melior, how is this crappy mall progress? You seem to be a design-build firm. Does your firm specialize in this kind of junky warehouse-esque aluminum panel facades? Also, you might not be aware: lots of people don't require money to better their quality of life. So, you might try understanding a different perspective that values an individual over sprawl. (Why can't I avoid getting suckered into responding to these kinds of online comments?) Also, if you're in construction, you (and I both) know that developers are some of the slimiest people around. I'd be very afraid of being taken advantage by them - good point. Bravery and integrity?? Integrity to what- selfishness, dementia, stubbornness, and anti-progress? I think everyone can admit that this is absolutely ridiculous, and makes no sense to everyone involved, including Edith, who could have bequeathed that $ to needy heirs or a better cause. Bravery? It\'s quite the opposite that motivates these \"nail house\" people. It\'s fear. Fear of change. Fear of being taken advantage of by big bad smooth talking \"Bob the Builder Developer\"- who wants to give you one million dollars to better your quality of life. Truly sad. And mind numbingly frustrating. Will they raise the house with balloons? Or will they only raze it? I think you mean they plan to "eventually raze" the house. The Lady is being economically irrational. But no matter, once she is deceased the developers will take over the rest of the property. I wonder how exactly she is coping with the visual blight issue because three out of four sides of her house are completely blocked off from the sun and the rest of the world. @darrylecook, doubt it. Not much in there, but a Trader Joe's, a gym, a UPS store, and a few other things. The building is mostly empty. Pretty sure this is an attempt by the developers and architects to create buzz for mall business, but cool anyway! Are they using balloons to raise it, or a bulldozer to raze it? A shame it has to be razed to commemorate her bravery and integrity.